It’s easy to look back at years gone by with rose tinted, soft focussed, strawberry scented glasses… so it’s often comforting to be reminded that things were often just as tough then, as they are now. It certainly can be tricky for creative types, whether you be in music, art or the flicks – it can feel as though you’re climbing up a hill made of porridge. With a mahoosive rucksack on your back filled with cans of Heinz Tomato Soup. 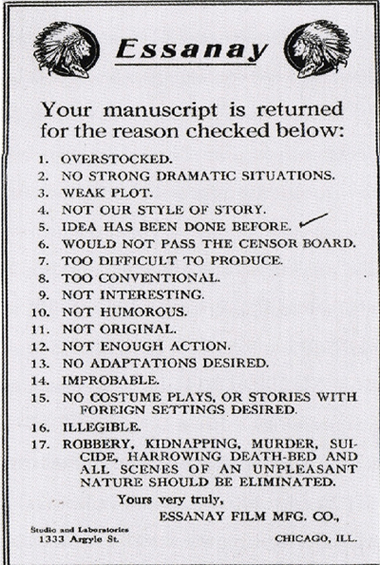 Essanay Film Manufacturing Company (1907 – 1925) is best known for its work on the Charlie Chaplin films and above is its stock rejection letter, (found at www.lelalondon.com) it used to send out to all those hopeful screenwriters whose scripts just didn’t cut the mustard. Ouch.